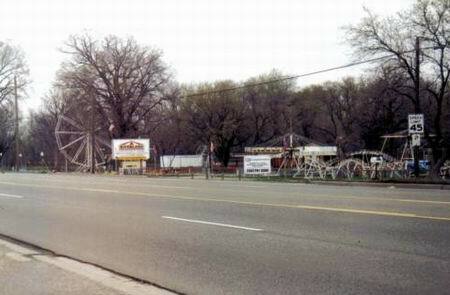 Utica Amusement Park was my first paycheck job when I was 13 in 1971. I used to cut lawns for 25 cents in Utica Estates 21/Remer area. One of my customers was related to Ron Brown and she asked me if I like a job. I recall riding my bike to the park meeting Ron and Suzie. They offered me 25 cents an hour and I was happy to take it. Ron put me to work immediately picking up trash in the park and picnic grounds. I was the youngest guy there. I think people thought I was much older. The high school guys trained me on how to operate the rides with exception to the tilt-to-whirl and ferris wheel. It was a great place to work! The loud speakers played rock music all day while the park was open and for a 13-year-old teenager the scenery couldn’t be better. My family moved to out of state end of summer in 71. Then we moved back to Utica when I was a sophomore in 73. Ron hired me again in early spring. He and I set up the rides. I made a discovery. Not many people know this but there is an old dancehall in one of the back buildings. This is where Ron stored the merry-go-round horses and other ride parts/fixtures. I guess it was quite a place in the day. This fall I took my grown kids and granddaughter to see the park and discovered it was gone! What a disappointment. I had so many great memories and funny stories from my experience. I grew up directly across Van Dyke from this park. I worked there for a couple summers for Ron Brown. Great memories working there. Seems like I always got stuck working the kiddie Ferris wheel, but I didn't mind it at all. Closest ride to the mini-golf course, where all the cute girls worked. Summer crushes were the best as a kid. I recall even working on Ron Browns farm, tossing hay bales a time or two. Great first boss. I used to work here every summer when it was Utica Amusement Park. I thought it was Super Fun!!! After work most of the people working there would hang out until the next afternoon. One thing I will never forget is during one picnic a group of small kids found a dead body of a (presumed) homeless man in the woods. My sone also had the opportunity to work there when he became a teenager also. I worked at Utica Amusement Park during the summers of 1973 and 1974. I ran rides like the Tilt a Whirl, Ferris Wheel, Merry Go Round (where the music came from! ), the Flying Chairs, Boats, etc. Also helped set up the rides in the beginning of the season and tear them down at the end, and of course cleaned the park, moved picnic tables, cut grass, and other grunt work. My first job. I remember Ron and Sue Brown very well, and had a lot of good times there. I never took a picture there, unfortunately. Wish I had some. Back in the Mid 1970's we would go to then Utica Amusment Park with the Centerline Parks and Rec program was a great day. Latter when the park was Riverland we went with my daughter my Dad worked for Ford and the UAW did a picnic there. We went on the Farris Wheel and watched my daughter ride the Merry Go Round. Was sad to see it closed up. I loved riverland. My gramma used to take me there all the time when I was like 4-9. I drive by every morning on the way to work and think about it. I think it did look kind of run down even at the time but it didn't matter, we were having so much fun we didn't care if it needed a coat of paint, etc. It's so sad they had to sell it!!! I would have loved to take my grandson there like my gramma did me. I only have brief memories of this park. My grandpa worked for Ford and he had his company picnic there one year. I was too big at the time to ride most of the rides, but I remember how cool it was. Looking back at the pictures, it looks so junky. Funny thing is, if you Google search it, it says it is still there on some websites! Nothing was built in its place, I pass by it everyday and see the run-down fence and empty grass wishing I could see it be there again. I have so many happy memories from this park. We lived by erma's frozen custard and my parents took us often. The last time i was there was for haunted house some one put on for someone in need in the early 90's (they did a great job scared out of my wits). I loved the boats the most, always wanted to ride those first, untill i missed my step and went in the water. My sister never let me forget that. I wish it would have been open when my kids were younger. Would have loved for them to go. My first job - Utica Amusement Park. July 1, 1973 - I started as the bathroom attendant! I quickly was promoted to other areas of the park and remained an employee for 5 years. From the Cotton Candy Machine, to the ticket booth, dart booth, Putt Putt Golf - I did it all. I left after the summer of 1978. I truly enjoyed working for Ron and Sue Brown and have many fond memories of the park. I will have to look thru my archives for Vintage Photos!. the last year this park was open , i was in one of the last bands to perform in this parks venue, we were called motorcade, it realy is sad to see these parks close up after all the years they were open, as it seems the older we get , the more that seems to go ,i also attended the chrysler picnics they had every year as i used to work for them in the day,i used to take my 3 boys to the park when they were just little, they saw me perform there before they moved to arizona and that was the last time i was in that park, it was fun while it lasted. The sad thing is these parks are disappearing and no one is willing to step forward and save them. When you look in Southeast Michigan at the number of parks there us to be and see that there are basically none left (cedar point doesn''t count), its a shame we let them all go then wish they were still there. Cheers to the good ole days. I know this is short notice, but later today, there will be a car show on the grounds where Riverland once stood. All who want to attend may come See you there. The property and rides of Riverland have been sold for about 10 years now. The owner a friend of mine said that the property taxes were getting to be too much and with the video game generation carnival rides are just not as hot as they used to be. It was great fun working there and even more fun tearing the place down. almost all of the rides were sucessfully sold on ebay the former owner has a small mobile carnival based in Ypsilanti MI you can check out the rides by googleing GTA amusements. i am saddened by the Parks Closing I lived at Utica From Birth until 26 Years old. Many of My Friends from Utica High and Stevenson High worked thier summer vacation at Utica Amusement Park. Here at Traverse City Michigan has never had a Real Amusement Park. Cherry Festival is one week of what Riverland was all Summer long. My grandfather helped build the Utica Amusment Park as we called it. There was also a restaurant called Brownies at the park and my parents and grandparents used to go there for hamburgers. My grandmother knew Mrs. Brown and my father used to take my brother and I to the park all the time. I remember going on the whip and the flying chairs and the ferris wheel. I also remember the great cotton candy they served. I have so many happy childhood memories of the Utica/Riverland Amusment park along with Mr. and Mrs. Brown and the Carrizal family. I guess it was fate that we would all cross paths. Hello, My Grandparents Myron & Rita Brown had originally owned Utica Amusement Park but later had passed it on to my Uncle Ron Brown. I worked there many summers. I graduated in 1976 at Utica High School. My brothers are Greg Carrizal, Kerry Carrizal & Todd Carrizal. If anyone would happen to have any old pics of Utica Amusement Park, I would sure appreciated hearing about it. I can be contacted at rferguson57@yahoo. com. I recall begging my parents to take me there when I was 5-6 yrs old. It seemed huge then. Man I was tickled the one time they did take me. I had worked at Utica Amusement Park for three years from the summer of ''78 through 1980. I lied to Ron (the owner) and told him I was 14 but I had only turned 13 the previous October. It was easy work during the day but after the rides were over the real work started. Cleaning up after many of the parties was pure misery. People could be real pigs. I drive by there once in a while and am saddened the rides are gone and the land speculators have all but torn the structures down. Seems suburban flight has even touched the memories of us who are suburbanites. I used to live near this area in the 80s and Fords Utica Trim Plant Local 400 used to hold their company picnic there every year until Four Bears Water Park was built I know this for a fact as my mother was a Ford Motor Company Employee at Fords Utica Trim Plant for 34 years there still isnt any apartments there yet as of 09 June, 2006 here is an aerial for Riverland look for the dirt that looks like the letter B to the right of the paved road which is Van Dyke Ave. (M-53). http://maps. google. com/maps?f=q&hl=en&q=Riverland+Amusement+Park+Sterling+Heights,+Mi&ll=42. 619213,-83. 031363&spn=0. 00379,0. 008787&t=k&om=1 http://maps. By Kara G. Morrison / The Detroit News STERLING HEIGHTS -- Set at the edge of a suburban landscape of strip malls and chain restaurants, a quaint carousel and Ferris wheel catch ones eye from Van Dyke Avenue. 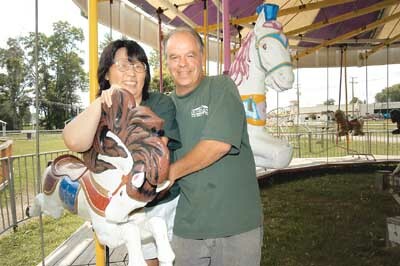 This is Riverland Amusement Park, the workplace of Rick and Emiko Roll of Ypsilanti since 1989. And it is here The Detroit News found the perfect location for our fall fashion shoot. Riverlands rainbow of colors and 10 acres of nostalgic carnival rides perfectly capture the spirit of fun we were after. Built in the 1930s as a picnic area, the historic site was converted to Utica Amusement Park in the 1940s and renamed Riverland in the early 1990s. Despite its long history of family fun, and its place as one of the last mom-and-pop amusement parks in the state, Riverland may soon go the way of dinosaurs. Developers are interested in the park at 44000 Van Dyke Ave. , which means this fall could mark the last of the roller coaster and carousel pony rides here, Roll says. Its been a lot of work, and a lot of fun, he says. Weve met a lot of neat people. Most of the rides were built in the 1950s. Its gems include a pre-1915 C.
W. Parker carousel (the horses are circa 1950s) and an Eli Ferris wheel built in 1946. The place was also famous for hosting a world famous miniature golf tournament in the 1960s, Roll says. For the last several years, Roll has rented out the nostalgic park primarily for company picnics and corporate events. The park will crank up its rides and spin sticky pink cotton candy for the public at least one more time. A public car show begins at 6 p. m. Aug.
22. Admission is free, and cotton candy, hot dogs and other treats will be available for purchase. BY TAMMY STABLES BATTAGLIA FREE PRESS SPECIAL WRITER The ride is over at Riverland Amusement Park, which has been dismantled so an assisted living apartment complex can be built this summer on the site in Sterling Heights. A single horse from the C. W. Parker merry-go-round now prances silently in the Ann Arbor home of Riverlands last owner, Rick Roll. 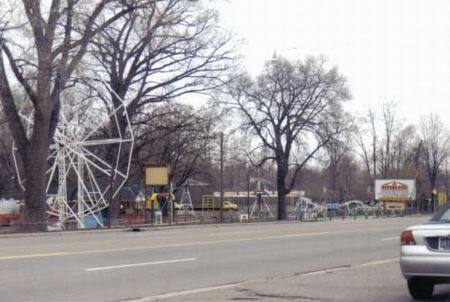 The Big Eli 12 Ferris Wheel was trucked away after a recent auction of the parks rides. Roll said economic pressures forced him to sell the 10-acre park property. Local corporations and groups cut back in recent years on company picnics, which were the financial backbone of one of the last family-owned amusement parks in metro Detroit, Roll said. And the number of guests on Friday and Saturday nights, when the park was open to the public, couldnt compete with the skyrocketing value of the property on Van Dyke Avenue at M-59. We didnt want to, really, Roll said of closing the park. We had to do what we had to do. Many area families have memories of warm summer nights along the Clinton River, with sounds of children shrieking after the roller coasters clackita-clackita climb up mini-hills. Dennis Johnston of Sterling Heights thinks wistfully of families who will miss the opportunity to take their children to weekend car shows or to ride the rides, as he did many years ago. His children are now 28 and 30. His wife, Antoinette Johnston, compares the loss to the extinction of drive-in theaters around metro Detroit. A lot of family things are going to the wayside, Antoinette Johnston said over dinner at the diner across the street from Riverland. Its a sign of the times. Riverland opened in 1935 as Utica Amusement Park, mainly as a picnic area. Rides were added in the 1940s, and the park became the site for the world series of miniature golf after the course was added in the 1960s. A group of three investors changed the name to Riverland Amusement Park when they bought it in 1989. And Roll, who owns and rents carnival rides for a living, bought the park after he visited during a corporate picnic in 1992. We had (corporate) clients, too, which helped us through 12 years at the park, Roll said. The Sterling Heights City Council recently approved rezoning the land from general business use to multi-family mid- and high-rise use, City Planner Donald Mende said. Construction on the three-story assisted living facility will begin after site plans are approved by the City Council. Every unit would have a view of the woods and the river back there, so it definitely would take advantage of the natural features more than a strip mall or a gas station would, Mende said. Dave Henriksen, second-year owner of Henricksens Golf Range, next door to the park, said he believes the new assisted living facility will complement the work hes put into improving the driving range. I hope it helps my business out, he said, adding that both Riverland and his golf range had fallen into disrepair over the years. I know Ive gotten a lot of comments on my place. If its going to be new construction and nice homes, thatll be nice.